I know people who like AFPEx, people who hate AFPEx, and people who haven't even heard of AFPEx (the internet-based Assisted Flight Plan Exchange). I belong to the group of people who like AFPEx. When I file a flight plan I know that it has been done, and that I'm not relying on a couple of other people to get my plan into the system. With IFR plans there's an almost instant ACK message that gets sent to your AFPEx mailbox indicating that all is well. There's no acknowledgment with VFR flight plans, but I've never had a problem with them going missing, until yesterday that is. My flight had started in Quiberon, but I planned a stop in Cherbourg to complete Customs formalities, i.e. walking through the empty Customs corridor. I'd logged on to AFPEx in the morning and filed a flight plan from Cherbourg back to the strip in the UK. On my way from Quiberon to Cherbourg, I called Jersey to get a crossing through the south-east corner of their zone and to get an early idea on the status of D036. Jersey mentioned my flight plan; when I first called, they'd looked it up on their system. Imagine my surprise when Cherbourg said they hadn't seen it, and neither had Nantes, the BRIA (French Flight Brieifing Unit) for that region. Despite knowing that it was in the system somewhere, I ended up having to call Nantes and file over the telephone. I called AFPEx this morning to find out if I’d done anything wrong and found out about a recent change that the French have introduced. When using AFPEx to file a flight plan you are offered a degree of help with the VFR addressing. 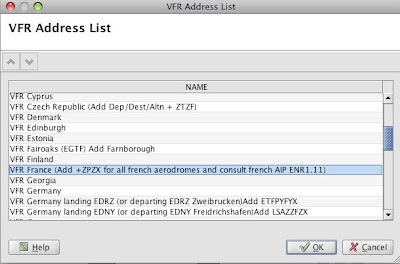 This is accessed by right clicking in one of the address boxes at the top of an AFPEx flight plan form and clicking through ‘VFR addresses’ and ‘Add VFR addresses’. You’ll then be presented with a box in which there is a list of addresses which are pretty much all collective addresses. By collective addresses I mean that the people at NATS behind AFPEx have grouped the appropriate addresses together under one single address, making life simpler for the user and reducing the possibility of errors. However, scroll down to France and then extend the box and you’ll see a note that suggests you consult the French AIP, specifically ENR 1.11. This is a document that sets out some new addresses for French airfields, addresses that right now AFPEx does not take into account. As an example, any flight departing from or arriving at Cherbourg will need the following list of addresses. To say this is a bit of a mess would be an understatement. The AFPEx team are well aware of this issue and are discussing it with the French with a view to finding a nice simple solution. In the meantime (and I’ll update this as and when I get news) the only way to be squeaky clean is to print a copy of the French AIP ENR 1.11 and follow the instructions there. "the only way to be squeaky clean is to print off a copy of the French AIP ENR 1.11 and follow the instructions there." Or get someone who is paid to know this sort of stuff to file your plan for you? Trouble is it is quite difficult to find that type of person in the UK, particularly if you fly from a strip or non-towered airfield. OLIVIA is a great, easy to use system, for flights to and from France, and of course it does remove the need for any addressing, that's done not by OLIVIA, but by someone at the other end, but the end result is the same. The downside with OLIVIA is that it doesn't work for flights that don't involve flying to or from France. Have just started doing some flying IN France, as well as to and from UK. It is my understanding that you have to arrive at a custom airfield,but it is NOT necessary to return to UK from one. Have recently flown UK-CHERBOURG-ALENCON-UK.Flying club Alencon had a computer, but Olivia wouldn't accept a UK destination.Filed by fax instead,no problems at all. Flight plan ex UK filed by APEX using drop down Addresses, no problems with the French. Having got bored with looking up the addresses for Feench flight plans in ENR 1.11 I have extracted the data from it and added it to an interactive map of French airfields that I set up a while ago. If you click on the airfields on the map you'll get a pop-up window with information about them. For those that appear in ENR 1.11 you'll also get the relevant codes to enter on your flight plan.